Going in to spring training a year ago, there was no bigger question mark in Toronto than the rotation. The fleeting summer engagement with David Price ended with heartbreak. Arguably the club’s best pitcher from start to finish, Mark Buehrle, was all but officially retired. Dickey was steady but old. Marco Estrada showed promise but it’s hard to put much faith in someone who had entered the season as a swingman in the middle of his career. The brightest pitchers going in to 2016 were the young Marcus Stroman and Aaron Sanchez, two blue-chip prospects with sky-high ceilings but significant reasons for concern. Was Stroman’s knee ready for a full season? Likewise, could Sanchez break out of the fireballing setup man role and handle a starter’s workload? One year later and these worries could not be any further from the minds of Blue Jays fans. The starters were great! Even the bullpen was good and, save for Dickey and a few relievers, the pitching staff remains intact and healthy going in to 2017. Despite this, the tone around Blue Jays fans this offseason has been negative. Not that there’s anything wrong with grieving Edwin’s departure. He’s one of the best power hitters of this generation and there have been no additions to replace him that inspire any confidence at all. But to talk about this team with anything but optimism does the starting pitchers a grave disservice. Not only did they exceed expectations last year, they showed that they are closer to their ceilings than their floors, and there should be more excitement around this team because of it. In the face of doubts from a year ago, the Blue Jays pitchers excelled. 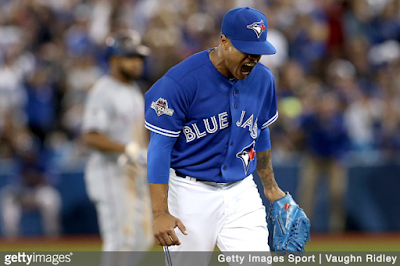 Sanchez emerged as ace and Stroman’s knee held up to the tune of 204 innings pitched. Estrada and Happ both pitched better than you can hope for the middle of the rotation, at times looking like number one starters themselves. R.A. Dickey, who was fine in 2016, passed the lovable veteran torch on to Francisco Liriano. All told, the Blue Jays had undeniably one of the best starting rotations in the majors last season, leading the American League with a combined WAR of 15.3 and were first in all of baseball with 995.1 innings pitched. Granted, the starters were exceptionally healthy, but that shouldn’t take away from the success and capability these pitchers showed. The Blue Jays starters didn’t just spend 2016 dominating either: they were improving. 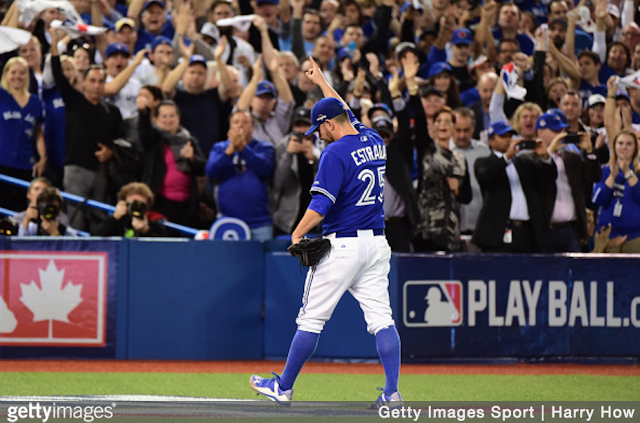 Sanchez, Stroman, and Estrada all posted better strikeout rates than they did in 2015. J.A. Happ pitched the most innings of his ten year career. Francisco Liriano, who the Pirates gave up assets to ship out of town, went from an ERA of 5.46 in Pittsburgh to just 2.90 in Toronto, even with the switch to the American League. Any one of these pitchers could easily take two steps back for each one they took forward, but the evidence points overwhelmingly towards a staff that will be just as good, if not better, this year. There is reason to believe in the 2017 Toronto Blue Jays, and the driving force in this faith will be run prevention, not production, something fans of this team haven’t felt in years. For the first time since 1998, the Toronto Blue Jays will start the season with the defending ERA champion in their rotation, and he might not even be their best pitcher. They have youth, experience, and are coming off one of the best seasons of pitching in franchise history. Marcus Stroman is a goddamn monster, downward plane be damned. We’ve seen great pitching before, but this rotation runs deep. This isn’t Roy Halladay and four days of praying for rain. Yes, you need greatness from your hitters too if you're going to win a World Series and Toronto’s offence will need to outperform expectations to even match last years production. But that doesn’t mean you shouldn’t expect a contender again this year anyway: their pitching demands it. The pitching staff isn’t foolproof. There are probably better fifth starters available than Francisco Liriano. Someone will almost inevitably end up hurt. Regression comes for us all. But fielding a rotation as strong, deep, and still with as much room for improvement as the Blue Jays are looking at right now is very, very encouraging, and no one should be surprised if this team hums and chucks their way to October in 2017.